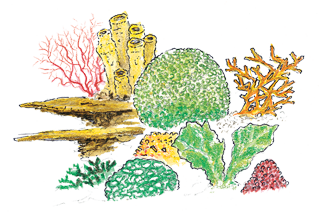 Healthy reef: The colorful beginnings of a new reef sprout on a ceramic tile that was placed near healthy coral in Papua New Guinea. The baby corals and coralline algae on the tile provide a glimpse of the next-generation reef. UNHEALTHY REEF: Algae and seaweed crowd out reef growth on a tile placed near Papua New Guinea’s CO2 vents. The more corrosive water mirrors what’s expected throughout the world’s oceans near the end of this century. ‘High rates of extinction’ to come? Imagine every person on Earth tossing a hunk of CO2 as heavy as a bowling ball into the sea. That’s what we do to the oceans every day. Burning fossil fuels, such as coal, oil and natural gas, belches carbon dioxide into the air. But a quarter of that CO2 then gets absorbed by the seas — eight pounds per person per day, about 20 trillion pounds a year. 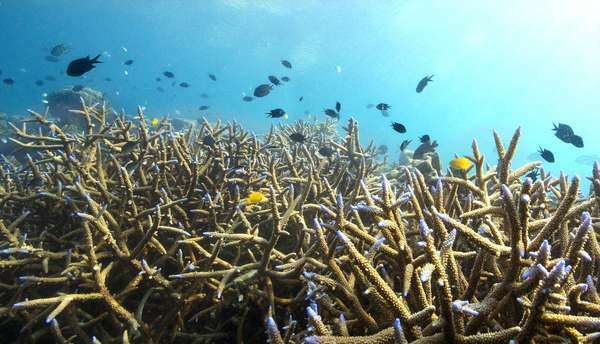 Healthy reef: Fish swim around branching corals amid a pristine reef near Dobu Island, Papua New Guinea. Unhealthy reef: Fabricius records data from instruments placed alongside corals in the CO2 vents off Dobu Island. Scientists once considered that entirely good news, since it removed CO2 from the sky. Some even proposed piping more emissions to the sea. But all that CO2 is changing the chemistry of the ocean faster than at any time in human history. Now the phenomenon known as ocean acidification — the lesser-known twin of climate change — is helping push the seas toward a great unraveling that threatens to scramble marine life on a scale almost too big to fathom, and far faster than first expected. Ocean acidification could disrupt marine life on an almost unfathomable scale. What are your thoughts and reactions? Here’s why: When CO2 mixes with water it takes on a corrosive power that erodes some animals’ shells or skeletons. It lowers the pH, making oceans more acidic and sour, and robs the water of ingredients animals use to grow shells in the first place. 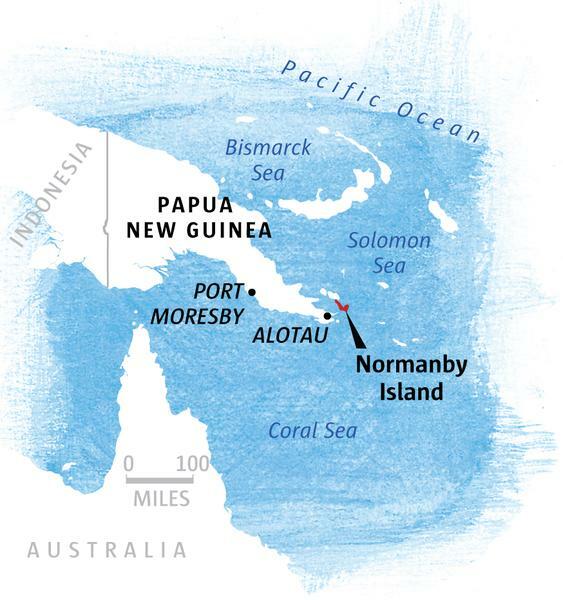 Island reefs of Papua New Guinea offer a window on our future, while fishing ports in Alaska and along the Washington coast show how the deterioration of food webs could strike close to home. Globally, we can arrest much of the damage if we bring down CO2 soon. But if we do not, the bad news won’t stop. And the longer we wait, the more permanent the change gets. Combined nationwide spending on acidification research for eight federal agencies, including grants to university scientists by the National Science Foundation, totals about $30 million a year — less than the annual budget for the coastal Washington city of Hoquiam, population 10,000. 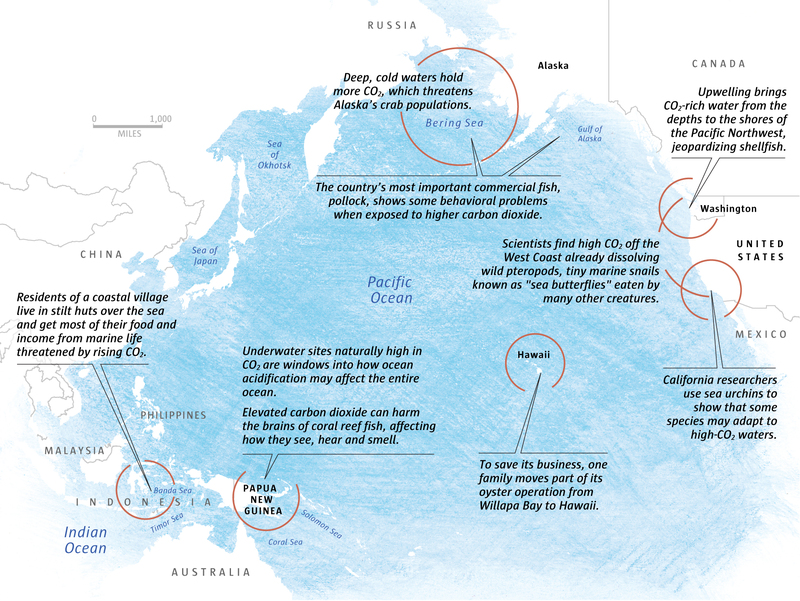 So to understand how acidification could transform marine life, The Seattle Times crisscrossed the world’s greatest ocean, from the sun-dappled reefs of the South Pacific to the ice-encrusted surface of the Bering Sea. How much carbon are we putting into the ocean? We’re dumping the equivalent of a hopper car of coal — about 100 U.S. tons — into the ocean every second. Acidification will strike every ocean, and no one can predict exactly how things will look — the seas are too complex for that. 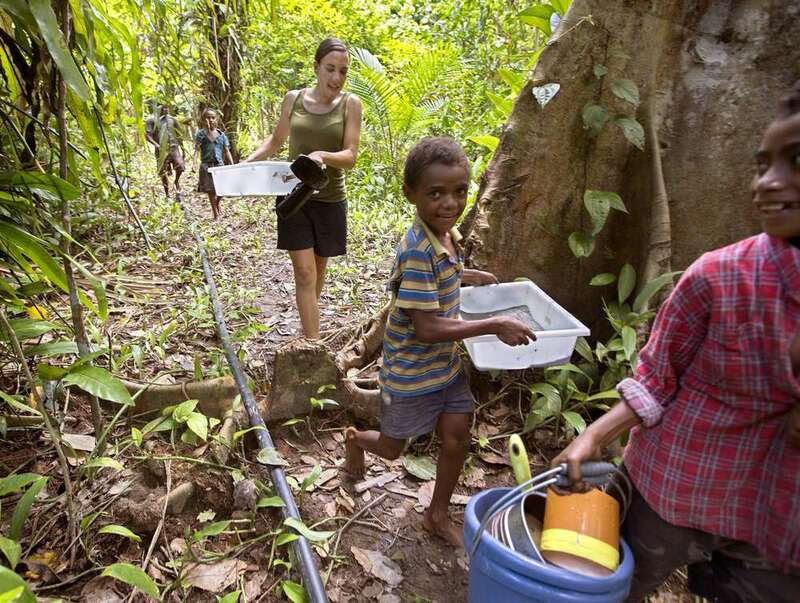 But the island reefs of Papua New Guinea’s Milne Bay province offer a window on our future, while fishing ports in Alaska and along the Washington coast show how damage to fish brains and the deterioration of food webs may strike close to home. Papua New Guinea’s Solomon Sea island vents are remarkable because of where they are: in shallow waters normally fringed by coral reefs as striking as fields of wildflowers. Katharina Fabricius swims through carbon-dioxide bubbles off Papua New Guinea. The waters here offer a glimpse of how acidification is likely to transform the seas. At dusk on the upper deck of the M/V Chertan, biologist Anna Kluibenschedl, at microscope, documents marine life growing on a tile removed from the reef off Normanby Island. Instead of tiered jungles of branching, leafy reefs or a watery Eden of delicate corals arrayed in fans, she saw mud, stubby spires and squat boulder corals. Snails and clams were mostly gone, as were most of a reef’s usual residents: worms, colorful sea squirts and ornate feather stars. The culprit: excess carbon dioxide. 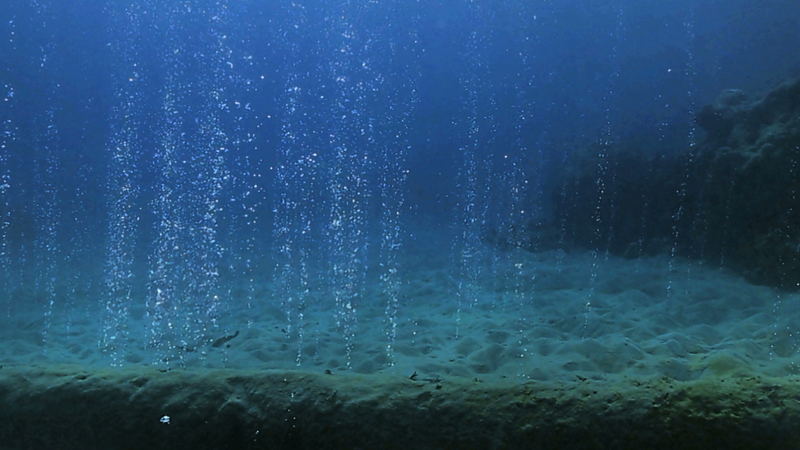 When CO2 hits seawater it becomes carbonic acid — the same weak acid found in club soda — and releases hydrogen ions, reducing the water’s pH. This chemical change robs the water of carbonate ions, a critical building block for many marine organisms. Clams rely on that carbonate, as do corals, lobsters, shrimp, crabs, barnacles, sand dollars, cucumbers and sea urchins. In Puget Sound, for example, 30 percent of marine life — some 600 species — draws upon carbonate ions to grow. Many species, from sea urchins to abalone, have some capacity to adapt to high CO2. But it’s not clear if they will have the time. Already, the oceans have grown 30 percent more acidic since the dawn of the industrial revolution — 15 percent just since the 1990s. By the end of this century, scientists predict, seas may be 150 percent more acidic than they were in the 18th century. Sea chemistry in the Northwest already is so bad during some windy periods that it kills young oysters in Washington’s Willapa Bay. In less than 40 years, half the West Coast’s surface waters are expected to be that corrosive every day. 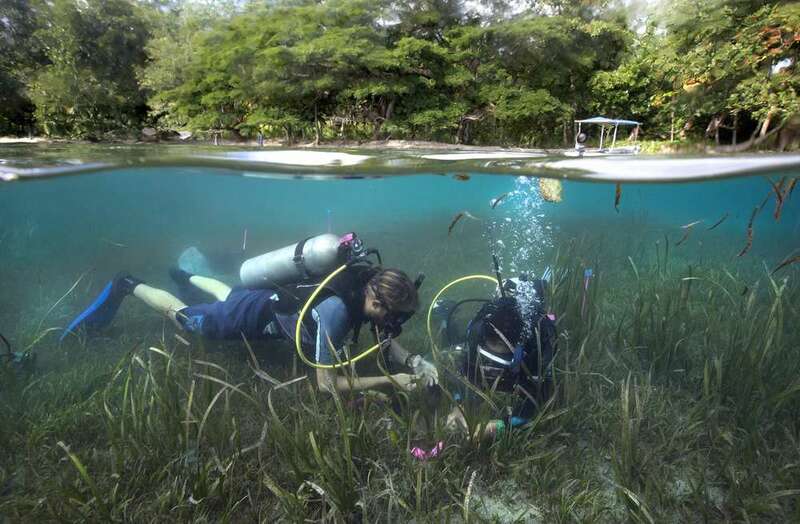 Biologists Sam Noonan, left, and Miwa Takahashi collect sea grass in Papua New Guinea. Sea grasses, which are expected to increase as the ocean becomes more acidic, grow far faster near the CO2 vents. Corals protect shorelines from erosion and severe weather and provide a dormitory where staggering varieties of life seek shelter. Those tiny plants and animals then become food for other creatures. Study after study shows the same thing — the more reefs collapse and fleshy algae spreads, the less we see of important tropical fish: wrasses, tangs, damselfish, parrotfish. One-sixth of animal protein consumed by humans comes from marine fish — in some cultures nearly all of it. The vast majority of wild seafood is fish, and fish account for three-quarters of the money made from ocean catches. Scientists once thought fish would dodge the worst direct effects of acidification. Now it appears that might be wrong — a fact researchers learned almost by accident. Clownfish swim through an anemone near Dobu Island, Papua New Guinea. 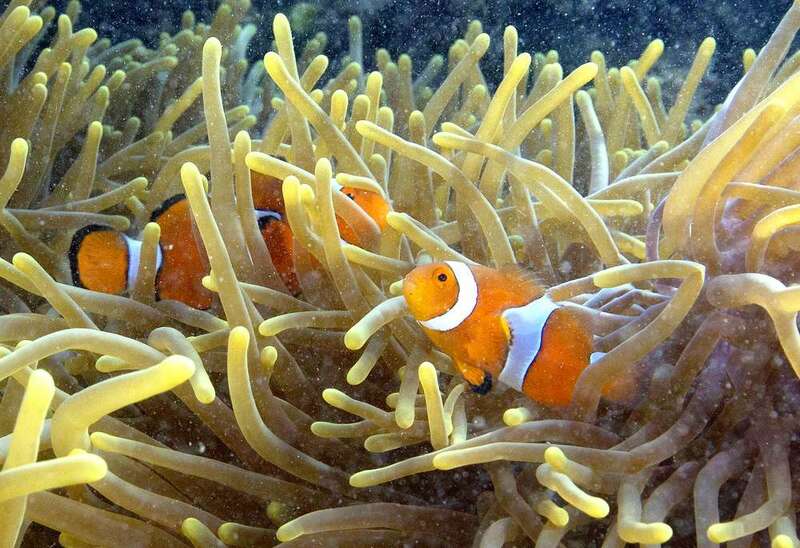 CO2 can alter how clownfish see, hear and smell, which increases the chance of death. Solving this riddle would help uncover one of acidification’s most haunting problems: its ability to scramble fish behavior. Dixson, then a graduate student at Australia’s James Cook University, wanted to find the olfactory cue that drew clownfish back to the reef. She tested smells from different water. She tested dirt. Nothing was quite right, until she looked up. 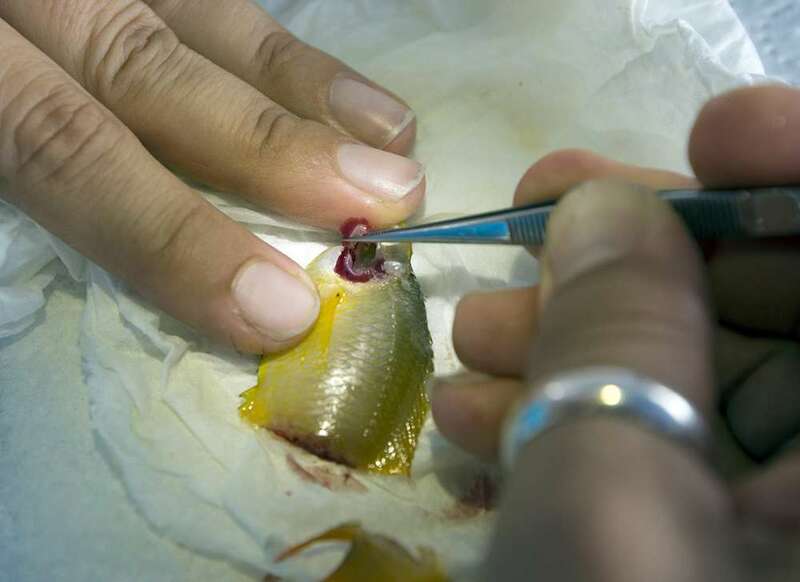 Biologist Jodie Rummer dissects a fish she caught at one of the carbon-dioxide vent sites off Papua New Guinea as part of her effort to understand how or if chemically altered water affects fish. Since Papua New Guinea’s island rain forests drape over the sea, Dixson took five island plants and spread the scent of their leaves in water. Young clownfish immediately swam toward the smell. “We thought, ‘let’s just combine the two experiments and see how it goes,’ not expecting that we’d see anything,” Munday said. High levels of CO2 can alter a fish’s sense of smell, hearing and sight — even its decision-making. That leads young tropical reef fish to die more often. Here’s what happens. Surprises came right away. Exposed to high CO2, the fish quit distinguishing between odors and were equally attracted to every scent. Since clownfish use smell to stay safe, the duo then exposed babies in high-CO2 water to dottybacks and rock cod — bigger fish that eat young clownfish. Over the next few years, scientists learned CO2 changed many reef fishes’ senses and behaviors: sight, hearing, the propensity to turn left or right. Baby reef fish exposed to high CO2 and placed back in the wild died five times more often. Even when baby reef fish and predators were both exposed to high CO2, young fish were bolder, ventured farther from home — and died twice as often. Most of this research had been limited to a select few tropical species. But scientists knew it wouldn’t take much for behavioral problems to impact consumers. 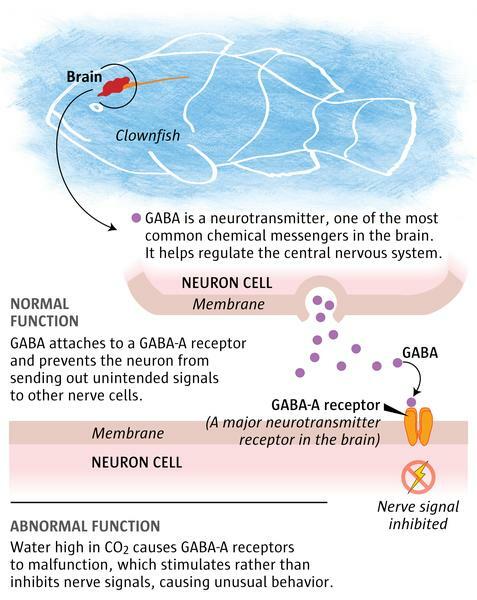 Walleye pollock show some behavioral problems similar to those found in clownfish when exposed to high levels of CO2. 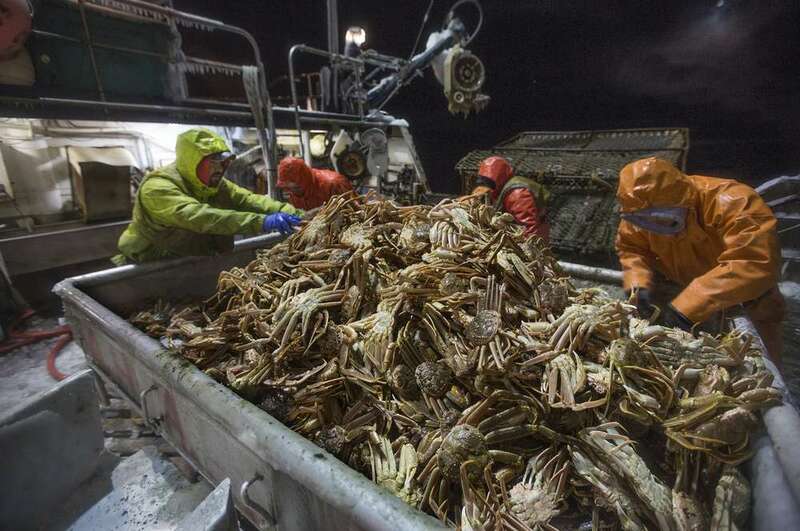 That raises concern about the North Pacific’s $1 billion-a-year pollock fishery, which accounts for half the nation’s catch of fish. Pollock “is the lifeblood of our local economy, certainly, and the state’s economy, and one of the largest industries on the Northwest and West Coast,” said Enlow, the plant’s manager. The North Pacific pollock catch is so big it sounds almost absurd. Fleets of fishermen and factory trawlers haul in 3 billion pounds annually. No other North American fishery operates on this scale. Seafood companies reel in $1 billion a year from that catch. Pollock gets carved into frozen fish sticks, sold overseas as roe and imitation crab, or packed in blocks. McDonald’s runs television commercials trumpeting the Bering Sea fishermen who supply pollock for Filet-O-Fish sandwiches. So pollock was among the first species the U.S. government tested in high-CO2 water. Results late last year brought no surprise: Acidification would hurt neither the fish’s body nor its growth. Adult and young seemed physically unharmed. “In some of the very early work it looks like pollock may show some of the same kinds of deficits that are seen in coral-reef fishes,” Hurst said. 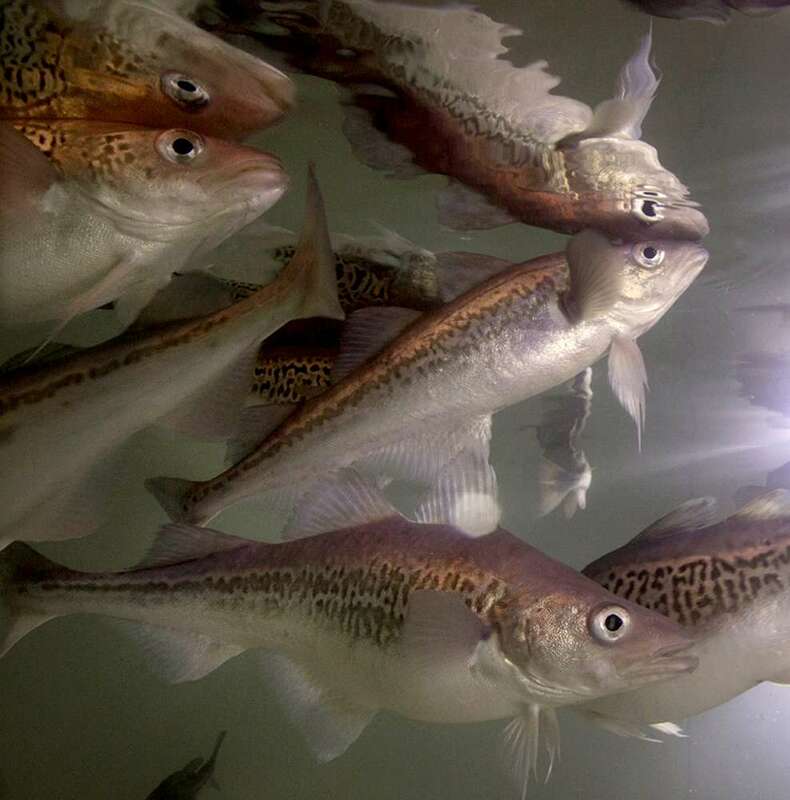 It’s too soon to say how — or even if — that would affect pollock fishing. Some tropical fish raised in high-CO2 water gave birth to young that adjusted to their new environment. Pollock might respond the same way. Dutch Harbor might as well be a distant Seattle suburb. Washington businesses or residents often own or run its trawlers, crab boats and processors. Employees typically come from the Puget Sound region. Even the former five-term mayor of Unalaska, Dutch Harbor’s municipal government, used to fish out of Ballard. And that’s just one species. Similar tests are under way for rockfish, cod, several kinds of crab and sharks. 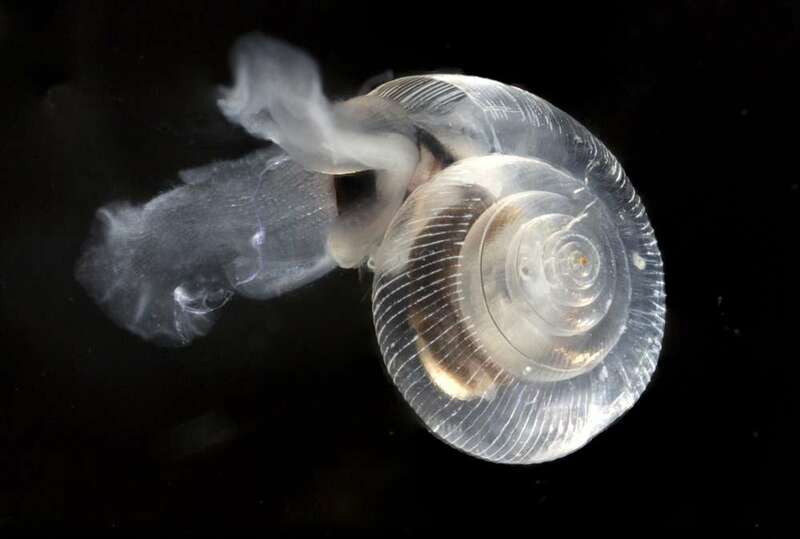 This pteropod, also known as a sea butterfly, comes from Puget Sound. The tiny shelled creatures are an important food source for many fish and seabirds. The shells of pteropods already are eroding in Antarctica, where the water chemistry isn’t as bad as it is in parts of the Pacific Northwest. Pink salmon swim through Finch Creek, near a salmon hatchery on Hood Canal. Pteropods make up roughly half the diet of young pink salmon in Alaska. The United States does so little monitoring of marine systems that we know almost nothing about the health of creatures that form the bottom of the ocean food chain — things like pteropods, krill or other important zooplankton called copepods. The most-studied animals remain those we catch. Little is known about the things they eat. Reporter Craig Welch, along with NOAA oceanographers Jeremy Mathis and Richard Feely, answer reader questions. Kaplan tracks the Pacific coast — temperature, pH levels, currents, salinity. He incorporates studies that detail how CO2 impacts creatures. Then he extrapolates how all those variables are likely to affect the fish people catch. While the models are rough and uncertainty is high — too many elements cannot be controlled — the trend is clear. Kaplan’s early work predicts significant declines in sharks, skates and rays, some types of flounder and sole, and Pacific whiting, also known as hake, the most frequently caught commercial fish off the coast of Washington, Oregon and California. Capt. Ben Downs stood atop the wheelhouse of the F/V Pacific Dove, in Westport, Grays Harbor County, on a recent summer day as he rolled on a fresh coat of whitewash. Downs spent years piloting one of the coast’s biggest whiting boats. This day he was prepping for shrimp fishing. Coastwide, fishermen bring in tens of million pounds of whiting a year. It’s the biggest product at Westport’s fish plant, which at times employs a quarter of the city’s workforce. Dave Fraser, who runs a whiting fishing cooperative, wasn’t skeptical, but weary. Fishermen already face tangible crises daily: the dollar’s value swinging wildly against the yen; quotas falling based on routine marine shifts. 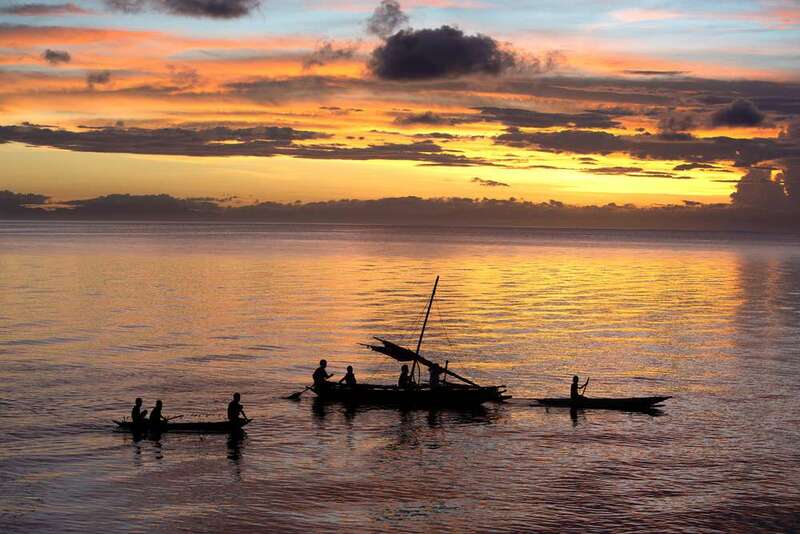 On a warm Papua New Guinea night, a quarter-mile from Fabricius’ CO2 vents, Edwin Morioga and Ridley Guma sat in the dark in a canoe and prepped their spears. 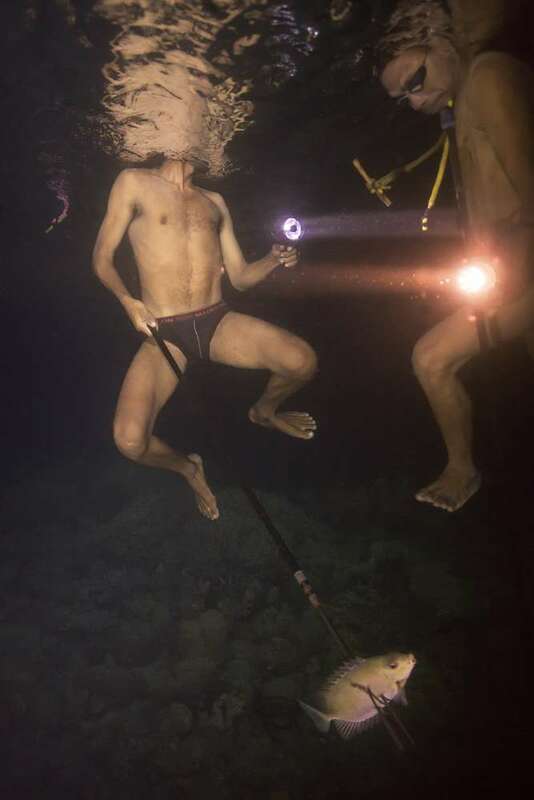 Ridley Guma and Edwin Morioga dive at night using spears and flashlights to catch reef fish off Normanby Island, Papua New Guinea. The pair slipped into the water and floated face down, flashlights trained on the reef. Neither knew much about Fabricius’ acidification research. 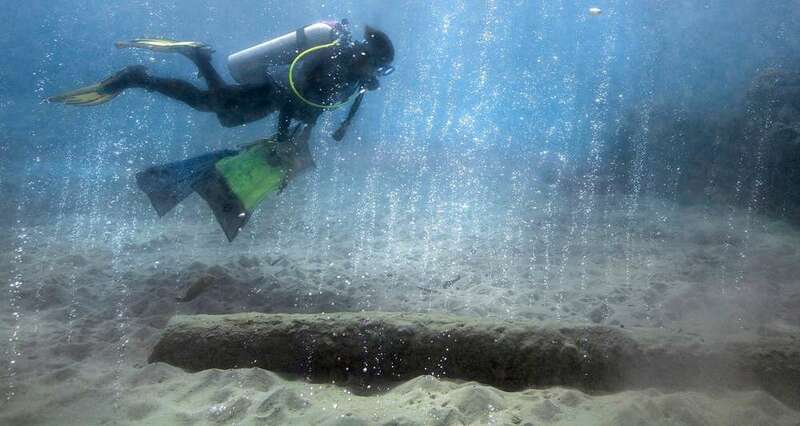 But they agreed they did not want CO2 from the West or an industrializing Asia transforming their reefs into places resembling the desolate nearby bubble sites. On the end of his spear writhed a tiny rabbitfish, his first catch of the night from what remains one of the world’s healthiest reefs. Less than a decade ago, scientists expected acidification wouldn’t harm marine life until late in the 21st century. In the past five years, researchers instead have figured out it’s happening now. Here is a timeline of what we thought we knew — and how that changed. Scientists begin to understand how carbon moves between the atmosphere and the sea. A handful of scientists predict rising CO2 emissions may change sea chemistry enough to harm corals by late in the 21st century. Atmospheric scientist Ken Caldeira predicts sea chemistry will change more rapidly over the next century than it has in tens of millions of years. Seattle oceanographer Richard Feely, with the National Oceanic and Atmospheric Administration (NOAA), and others discover North Pacific sea chemistry has changed dramatically just since they sampled it in 1991. Top ocean researchers release first major ocean-acidification report and brief Congress, highlighting marine changes they fear are possible by century’s end. Feely and colleagues take an ocean research trip between Canada and Mexico and find enormous stretches of seawater already changing in ways not expected for 50 to 100 years. Because of ocean currents, weather and geography, they figure out, West Coast sea chemistry — unlike oceans at large — will worsen for decades even if fossil-fuel emissions are cut. Scientists suspect sea-chemistry changes are killing oyster larvae in the Northwest, which would mean acidification is harming marine life at least a half-century sooner than expected. Oceanographer Jeremy Mathis finds the chemistry of water in the Gulf of Alaska changing more drastically than models projected. Mathis discovers CO2 levels in the Bering Sea are amplified by melting sea ice. That exposes more ocean surface to fossil-fuel emissions and lets in sunlight, which allows plankton to bloom and die, boosting carbon dioxide even more. The pH of broad stretches of the North Pacific is now so low several months of the year that some animals already may struggle to grow shells. 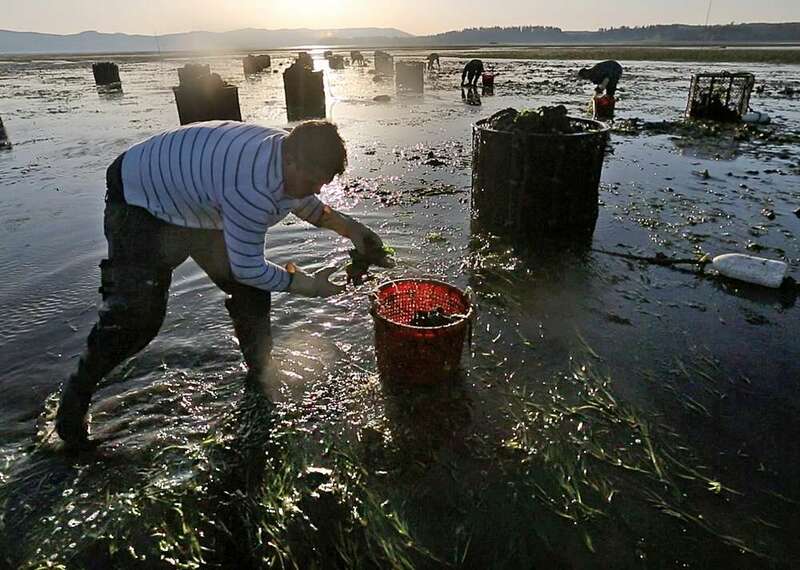 Scientists say they’re certain ocean acidification is killing Northwest oysters. Researchers show baby king crab die in high numbers when exposed to CO2-rich waters expected later this century. Mathis finds North Pacific sea chemistry at certain times of the year already is that bad. Craig Welch: 206-464-2093 or cwelch@seattletimes.com. On Twitter @craigawelch. “Sea Change” was produced, in part, with funding from the Pulitzer Center on Crisis Reporting. This article was published September 12, 2013.